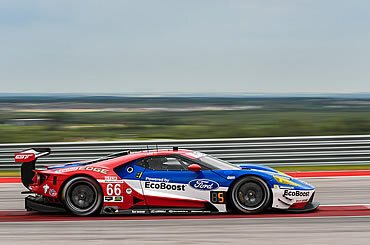 AUSTIN, Texas -- A pair of on-track incidents, one on the first lap and another halfway through the race, cost the Ford Chip Ganassi Racing IMSA Ford GT team dearly in the Lone Star Le Mans event at Circuit of the Americas today. Starting under a withering sun with a heat index over 100 degrees, the No. 66 Ford GT found trouble on the first lap when Dirk Müller was punted off the track by one of the BMWs, and he lost more than half a lap before he could return to action. Meanwhile, the No. 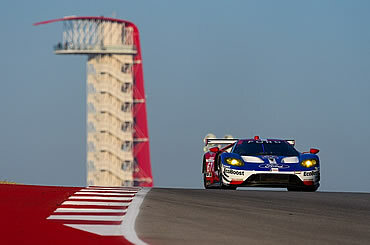 67 Ford GT, driven by pole-sitter Ryan Briscoe, got jumped at the start but had settled in nicely in the top four when on lap 35, the No. 4 Corvette cut down on him in a turn, causing contact that broke the steering rack on the car. That repair cost Briscoe and teammate Richard Westbrook 13 laps as the Ganassi crew hurried to repair the damage back in the garage. The car returned to the track and finished the race, but in ninth place. The finish, combined with the championship-leading No. 4 Corvette’s fifth-place finish, leaves Briscoe/Westbrook unofficially 11 points behind the leaders heading into Petit Le Mans at Road Atlanta in two weeks. The No. 66 car of Müller and Joey Hand battled throughout the race trying to get back track position, but could only climb to sixth in a 2 hour, 40-minute race with only one full course caution.